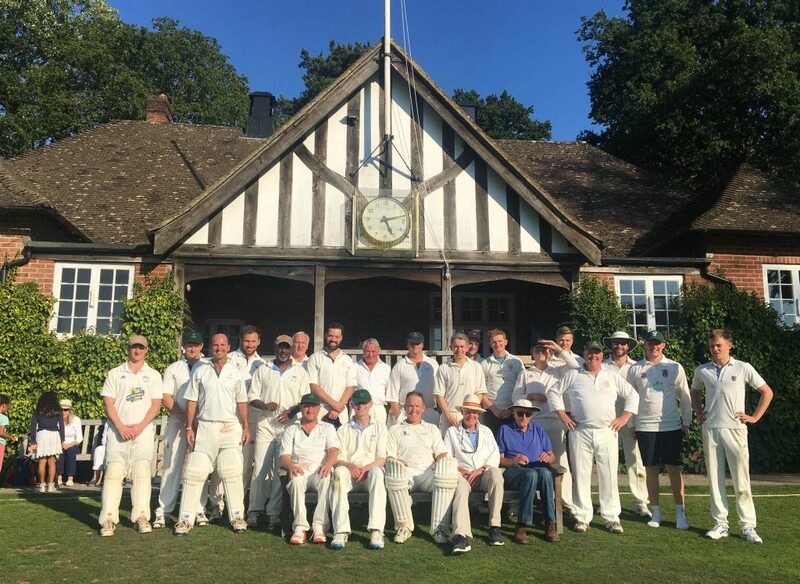 Founded in 1930, the Buccaneers is a wandering cricket club with Sunday fixtures, usually all day, throughout the South East of England from Oxford and Henley to Maidstone, Hurstpierpoint and Hurlingham. "Let us take our stand and play the game, but rather for the cause than for the fame"
The 2018 averages have been published and can be found HERE. Although the club was victorious against itself on the prior weekend, the Buccaneers entered the final encounter of the season in need of a win. They arrived at the delightful setting of Warborough & Shillingford, all the more attractive for the dry and balmy conditions, with a team bristling with talent. The senior pros bristled at the news that the captain had won the toss and elected to field; an act seldom performed in the long and illustrious history of the Buccaneers. Messrs Tom Grundy and Archie Walker opened with venom and hostility on a pitch with variable bounce, causing problems for batsmen and wicketkeeper alike. Extras made a steady start while runs off the bat were harder to come by. Archie Walker struck early and the home side stumbled to 37-3. The captain turned to spin and Simon Leefe and Archie March twirled away at each end, taking two wickets a-piece. A full toss drilled to Neil Robertson was pouched bravely, but at some cost: this was not the first time he has needed the first aid kit at this ground. To add insult to the injury he took a second smart catch with his nine healthy digits but it was rightly called no-ball. After a delicious lunch taken under the trees, the sort of lunch that deserves its own report, and after the port had been drained, the match resumed for the afternoon session. 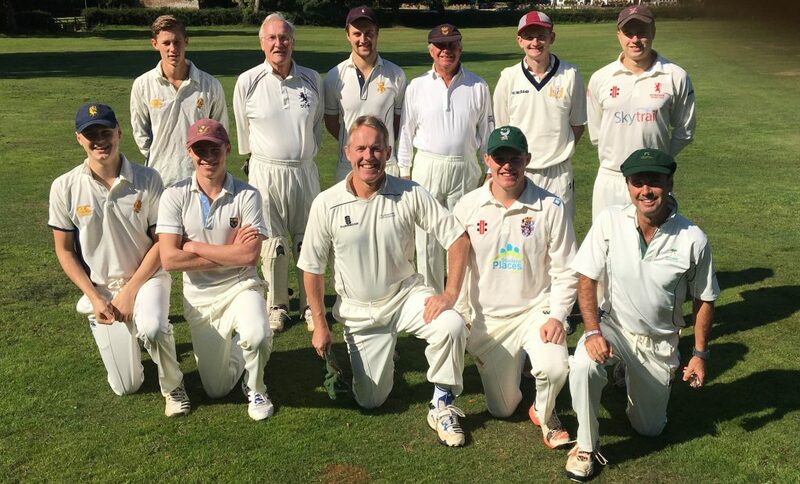 A quick-fire 77 from Johnnie Bradshaw, skillfully marshalling the tail, and a useful contribution from extras (a few runs short of its own half century) took the home side to 203 before the captain wrapped up the innings. Five bowlers had taken two wickets each in the 53.4 over innings. The batsmen were not to be so sharing. With a required run-rate of around a run a ball, from an available 37 overs, the opening pair of Vic Kandampully and Tom Fletcher started rapidly, finding all corners of the ground with sumptuous shot-selection. Kandampully was well caught on 29 from 27 balls before Ollie Robertson shored up one end against the sharply turning ball. 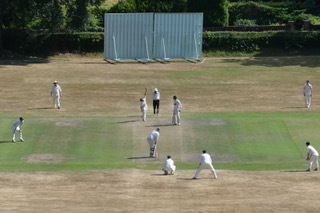 When he fell Simon Leefe joined Tom Fletcher, who had brought up his first fifty for the club. A missed stumping when on 70 proved to be the final hope for the home side: the run rate was gradually bought down and the game was brought home with 3.5 overs to spare. 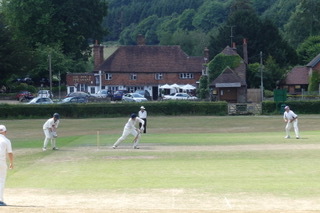 Tom Fletcher was not out on Nelson, from 103 balls, ably supported by the impossible-to-dislodge Simon Leefe who scored a fluent 35 from 42 balls. For him it was the second successful run-chase in successive weeks, and brought the Buccs’ season to close with a victory. 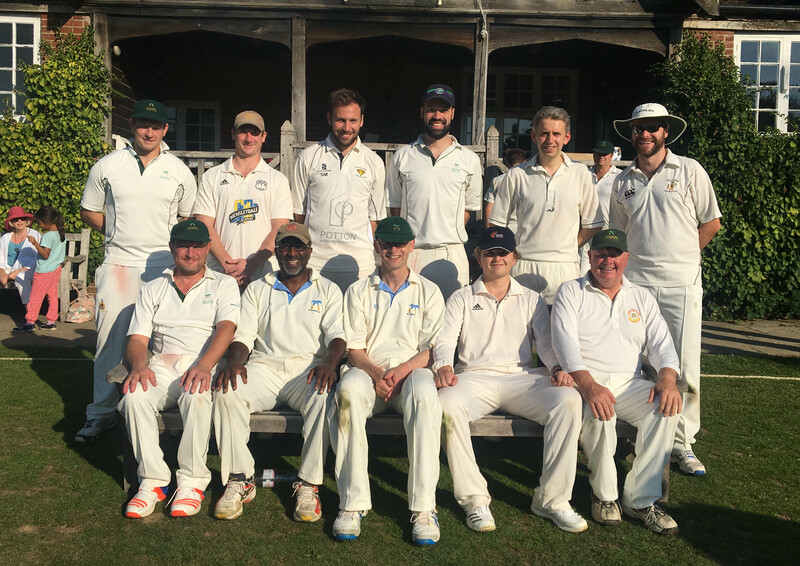 The teams retired to the Six Bells and Tom Fletcher, with jug in hand and maiden century in the locker, was the toast of the day. The captain touched down at Gatwick at 11.30pm the night before the match, after two weeks of hot weather training in Portugal, to be confronted by drizzle. The two days of rain (which had flooded Lord’s) was too much for a prompt start at Hurst, but proceedings got underway satisfactorily at 12.30pm. The Buccaneers were inserted and Jeremy Milne and Alex Rydon were up to the task with a fluent opening partnership of 86 in the first hour. Alex belayed his youth, with an experienced miss two balls before lunch to be triggered LBW. After a sumptuous lunch, play resumed with Tom Fletcher partnering Jeremy. He soon joined a growing list of Buccaneers to be run out while batting with him. Archie Marsh came and went after a busy little innings and then proceedings took a strange turn. While Jeremy had reached his half century with no hint of a chance, his progression to 81 included seven dropped catches. It was left to a stumping to see him off. No worries for the Buccaneers as Steve Moules was limbering up by now and smashing it to all parts. A fifth wicket partnership of 74, with Henry Rydon contributing 13, gave us some credibility on the scoreboard. Sadly the OHJs remembered how to catch and Henry was taken smartly on the boundary, with his father Will following next ball at slip. Steve departed and it was left to Ludo Milne and Rob Rydon to take the score past 250 and declare. Ludo came charging down the hill with the new ball while Tom Rydon had to labour up it. Ludo blasted out both openers, but then the quality of batting improved. Steve bowled a good spell up the hill, bagging one wicket, while Warwick Okines opened his account for the season with some twirling leg spin. Mark Semmence, who has probably scored more runs against the Buccaneers than anyone else, cruised ominously through the gears and the OHJs were easily keeping up with the run rate. Archie also twirled some leg spin to good effect, but the ninety run partnership (including five runs when the ball hit a helmet) was broken by a smart catch on the boundary by Ludo off Henry and then we were able to apply some pressure to the new bat. Thankfully, Semmence didn’t score another hundred against us and was smartly stumped by Tom Fletcher down the leg side off Henry. Ludo and Henry bagged another couple of wickets but we couldn’t winkle out the remaining batsmen and OHJs fell thirty runs short with seven wickets down. We drank some ale and listened to the Last Post being played as the OHJs lowered their flag for the last day of their cricket week. Next year is the fiftieth anniversary of this fixture and we expect to hear some stories of historic events through the ages (Hatrick off the first three balls of the match, anyone!). As the clock approached 8pm on yet another sun drenched Sunday afternoon the Buccaneers were left mad in Maidstone as they were robbed of victory at the last. The 10 men of the Buccs had battled throughout the day to set an imposing target and then squeeze the opposition on a lightening outfield and shirt front of a pitch. Victory was snatched away however, by the bizarre shout of “Not out!” from the Mote umpire after appeals for a clear run out. So blatantly short of his ground was the Mote skipper, that gloves were off for hand shakes and thoughts turned to the bar. A shame to end the game in this fashion after what started first as an exercise of cajoling players to turn up and was followed by some fine cricket. After an agreed toss, the Buccs were invited to bat first on another sweltering Sunday. Liam ‘premier league’ Ward and S Leefe opened up and got the the side off to a solid start. What followed was an excellent display of batting from everyone in the top order. Nearly all the batsman got starts with Ward showing his class by passing 50 in only his third Buccs appearance. Other notable contributions came from S Moules, M Harms, P Hobson and A Rydon, all of whom stroked the ball around nicely, finding gaps and ensuring that the Mote’s pretty woeful chat was kept to a minimum. As we reached 40 overs the Buccs fell away just short of 250. With only 10 men in Buccs’ colours, defending was always going to be tricky but as we were reminded throughout we had two players that had just two weeks prior lined up in the same side as Joffra Archer. After a decent tea, the highlight being ice lollies, washed down with several pints of the local pale ale, the Buccs took the field. The new ball was taken by Buccs debutante Dr James Knight, and T Rydon as the perils of 10 men started to show. The Mote getting off to a quick start. Skipper Berry then introduce the threat of left arm spin from both end with S Leefe and the skipper himself wheeling away for 16 overs. This slowed the rate considerably and Leefe in particular found ways of taking wickets at regular intervals. With the Buccs edging ahead in the game as the final overs came into sight the game’s flash point reared its head. Liam ‘I really am friends with Joffa’ Ward bowling, the opposition skipper batting, Dr Knight prowling the boundary, the Buccs victorious? Alas, as the Dr threw down the stumps from long on, the opposition skipper beginning to unpad, skipper Berry charging to the bar, the home umpire decided that he wanted a little more time in the sun. “Not out” he bellowed. Cue disbelief, on all sides. The Mote got over the line in the following over with the oppo skipper deciding to apologise for not walking. A bizarre time to decide to do so but there we go. We finished the day in the bar discussing the poor umpiring decisions from the history of the game. With just enough time for our premier league players to tell us which county players they will be fielding fine leg to next week. Thanks to all of those that traveled to the game with some long journeys among the ten men. Well done to debutante Dr James Knight, hopefully not the last time we see you in a Buccs shirt. A good performance given the circumstances and a real shame that we had victory stolen from us. Should make revenge all the more sweeter next year. 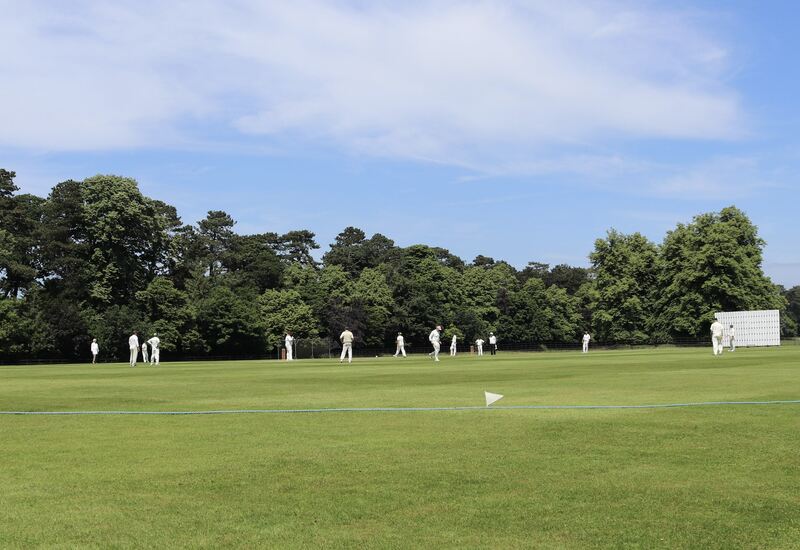 As Britain’s heatwave entered a fourth week, 11 Buccaneers braved the Surrey sun to take on Brook CC; a fixture that has fallen foul of the weather for the last three seasons. No such danger this season as the Buccs were greeted by a parched outfield that screamed runs. Following a delightful lunch of potted crab, washed down with local pale ales at the Dog and Pheasant adjacent to the ground, the pressure was on stand-in skipper Berry to win the toss – not least because the Buccs only numbered seven with 10 minutes before the scheduled start of play. Having duly won the toss, Berry made no hesitation in batting and the Buccs went out looking to post a decent score. Following a flowing opening partnership between Ollie Robertson and Jeremy Milne, a run out looked the only thing that would stop us. Cue a “yes, no, maybe”, angry stare, bat smacking pad, and a sigh of “oh dear” from the boundary and Jeremy was gone to be replaced by the skipper. Berry and Martin, and then Berry and Fletcher began the rebuilding process and started to stroke the ball with ease across the lightning quick outfield. Following a short interval for much needed refreshment, the skipper took the first over after drinks for four boundaries. Things were looking rosy for the Buccs at this time, until a dubious LBW decision from our ran-out opener sent Fletcher packing. The young lawyer was convinced that the ball hadn’t even touched his foot and is currently looking at which legal avenues are open to him. The next period of play went to Brook, who were excellently marshalled by their young skipper who also bowled the spell of the day. His off breaks, a mixture of ripping turners and difficult to hit darts slowed the Buccs’ progress. Berry, frustrated by the well set fields, looked to go over the top and was caught for 75. This brought together Leefe Senior and, following a few more wickets, Alex Rydon. The two plundered the bowling around the park to set up a declaration at the 38 over mark – giving Brook the same number of overs to score a tricky 250. What proceeded was a team with clearly too much suncream applied to the hands as numerous catches were dropped, misfields witnessed, and there were also overthrows galore. The skipper trying not to catch the eye of our President watching from the boundary. Credit must indeed go to Brook’s 19 year old opener who played a great array of shots and timed their chase perfectly. A classy hundred, coupled with some back breaking heaves from their number 6 ensured that Brook brought it home with an over to spare. What could have been if the Buccs has held on to a catch or two, or three, or 11. Our thanks go to our gracious hosts who put on a cracking game, played very much in the right spirit and one that we will look forward to next year. Time to practice a few catches before our next game in two weeks time. Match report courtesy of Nomads CC can be found here.